Nestled between a busy road and a small creek notorious for flooding lay a place that I've jocularly referred to as "The Junk Hole" since I was a small girl. 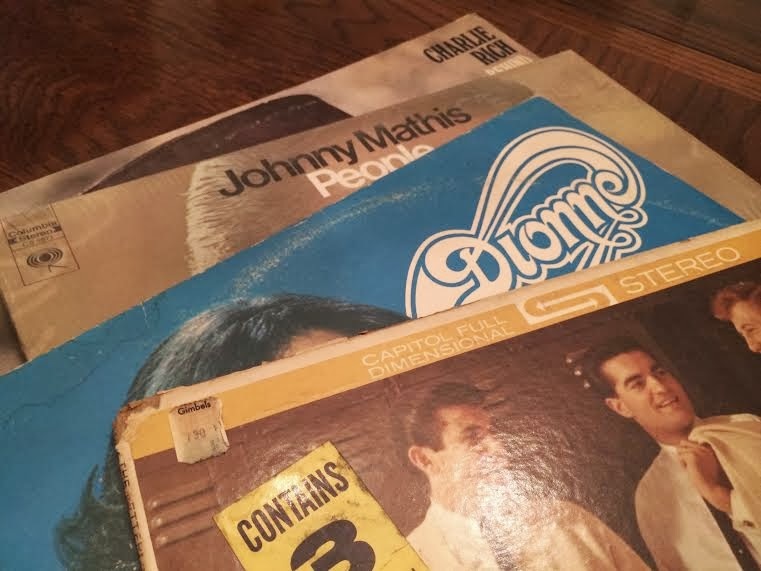 The Community Thrift Center is full of junk and it definitely gives off the hole in the wall vibe but it's also a goldmine for buried treasures. It's the ideal spot for scoring found objects, records for pennies and random odds and ends. Over the years, I've spent countless hours shuffling through its shelves and rummaging through the racks. My family and I have adopted everything from Chanel scarfs to Christmas trees at this charming little establishment. There's not much you can't find at a place like this. 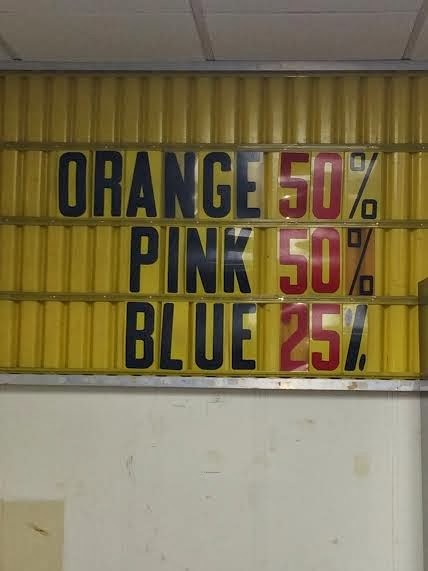 The prices are among the best I've seen within the secondhand market in Pittsburgh. The odds are good but the goods are odd. And I like it like that. 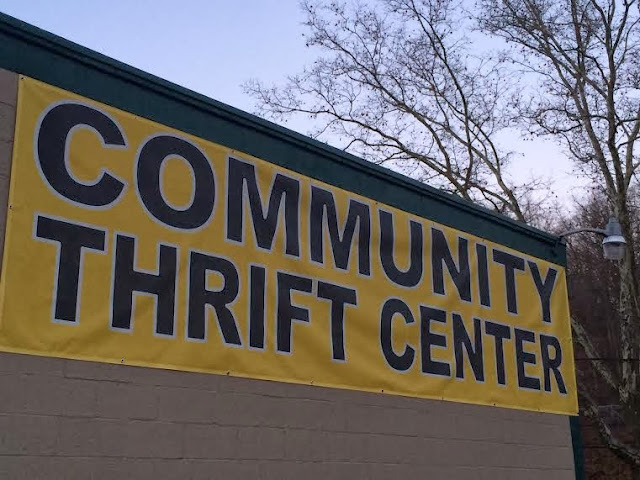 Should you find yourself at Community Thrift on Babcock Boulevard in the North Hills, be sure to take note of the sales. It changes daily. Pop some tags. 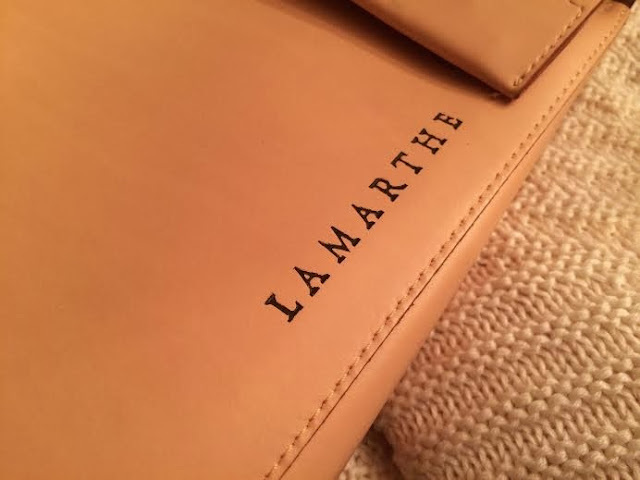 Lamarthe Leather Handbag. Made in Italy. French brand. I spotted the craftsmanship on this beauty from a distance away. 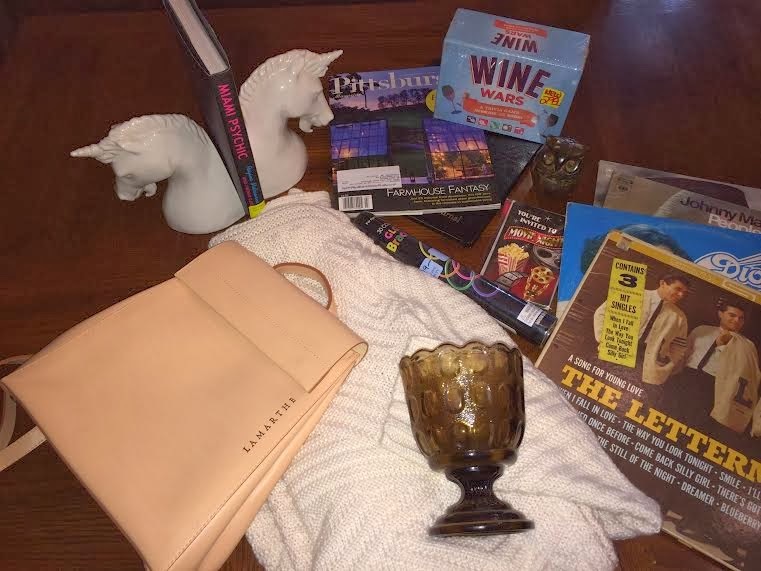 Upon closer inspection, she was in nearly perfect condition with the dust bag included (love the unicorn logo the brand uses- obviously, check out of the other items I got). When I was in grade school in the 90s, book bag style purses were all the rage. They're apparently making a strong comeback. This particular design isn't something I'd typically go for but for $15 (it was 50% off and retails for hundreds), the quality of the leather and unique designer was too good to pass up. Chico's Exta-Long Wool Sweater Cardigan: This looks like it was never worn. Brand new condition (and it probably originally cost somewhere in the neighborhood of $200). It's difficult to find a really long sweater (this hits at about my calves). This style is perfect to throw on for extra warmth or to pair over leggings. I'm always cold so I get a lot of wear out of things like this around the house or if I'm going somewhere like the movies. I recently joked with some of my girlfriends that I must be getting old because some of the window displays at Chico's are starting to appeal to my style. Find it at the thrift store? All the better. E.O. Brody Glass Co. Vintage Vase/Dish: My Mom has always been a fan of Depression glass and other unique pieces. Her love of this type of thing was definitely passed on to me. I've always had an appreciation for antiques but as I've gotten older, glassware has really stood out to me. I love glass like this for a number of different uses- alone on a shelf or table as a decorative piece, as a candle holder (a la Waverly and Irving), as a vase for floral arrangements or a candy dish. The smoky quartz color of this particular piece really caught my eye. I thought it was a bold neutral that would go nicely with a number of different interiors. Records: For .49 an album, I'm happy to give these a new home. Charlie Rich, Behind Closed Doors (1973), Johnny Mathis, People (1969), Dionne Warwick, Dionne (1976), The Lettermen, A Song for Young Love (1962). Party Invitations: I love to have friends over for a movie night and thought these little invites were too cute not to snag. It'll give me an excuse to plan a little viewing party for something fun and use some of the new address labels that I recently got! Glowstick Bracelets: Speaking of parties, my birthday is a couple weeks away and I thought these might come in handy. I love a little glowstick action. 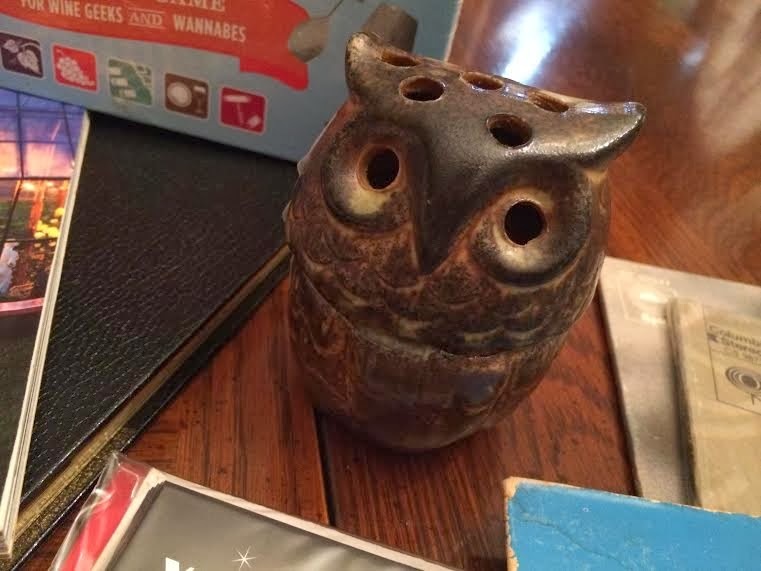 Decorative Owl: Well, I brought this little handmade guy home with the idea in my mind that he was a votive candle holder. Well, my standard-sized votives were too big for his little head and the flame got his body a bit too heated for my liking. 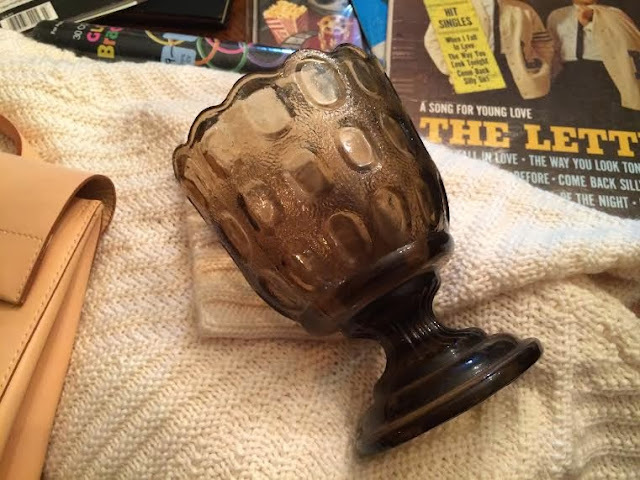 The battery operated votives were also too big. I have no idea what he's supposed to be. Maybe I'll store knickknacks in him or just keep him as a figurine. He would have looked so cute lit up. Disappointing. Pittsburgh Magazine: I picked this issue up because it features the best homes of the year in Pittsburgh- notably, my favorite, The Farmhouse! I had all intentions of posting an in-depth blog about this property but never got around to it. Perhaps after reading the article, I'll have more inspiration. I'd love to have a party at this place (it would make for an incredibly romantic wedding reception venue). Journal: I'm constantly jotting down notes- everything from ideas, lyrics, food I ate, to-do lists, and more. 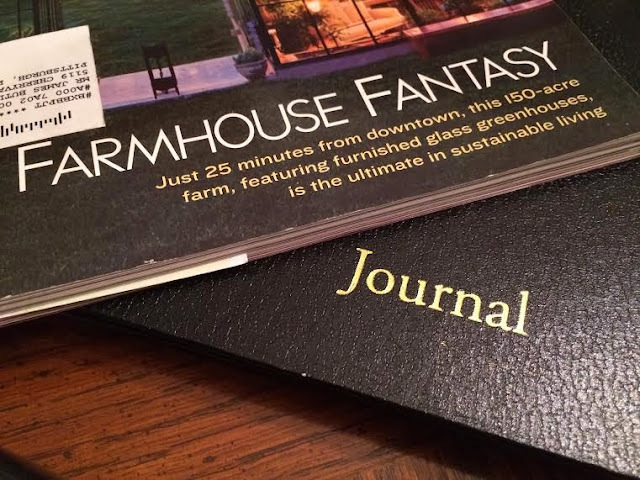 I pretty much collect journals. I love them and am quick to get my hands on good ones. Finding such a nice one that's unused and at the thrift store is definitely a score. Wine Wars: My Mom found this little game that's supposed to be educational. I thought it would be fun to have a little game night with a few bottles glasses and good times. Wine Parties are always a blast. I love the blind testing games and the conversation. Miami Psychic by Regina Milbourne. I love all things paranormal or psychic-inclined. I browsed through this title at the thrift store and admittedly, my first impressions were questionable but I gave it a go anyway. It seems a bit "trashtastic" but who doesn't love a good guilty pleasure read? Unicorn Bookends, Takahashi San Francisco: This was by far my favorite find! I was positively giddy when I came across these magical little creatures on a high shelf at the store. 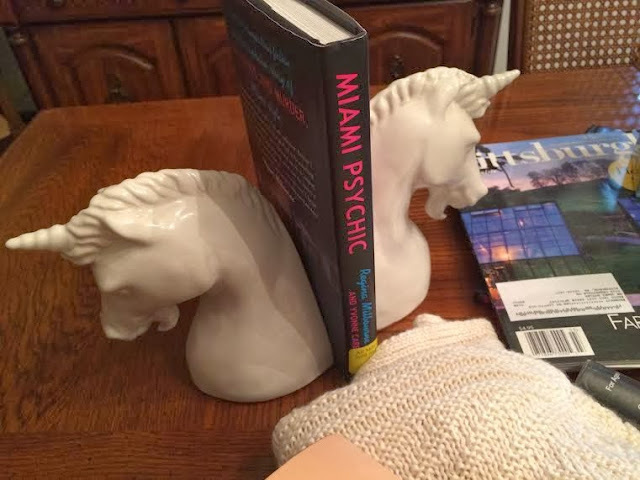 I've been on the lookout for ceramic unicorn bookends for the past year. The ones on eBay were a bit overpriced and the sets I saw on sites like One Kings Lane were way too steep. For $6, it wasn't the steal of the century but by comparison it was definitely a bargain and well worth the wait. I've always loved unicorns (for a couple different reasons), so these will be special to me for some time. I can't wait to display them!